Here in this critical guide is all the important foraging techniques that you’ll need to know in order to survive in just about any situation. 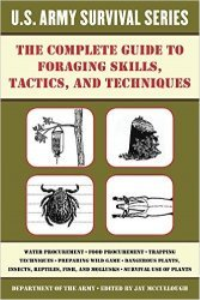 From selecting edible berries to trapping small game, The Complete U.S. Army Survival Guide to Foraging Skills, Tactics, and Techniques has got you covered. With dozens of photographs and illustrations demonstrating these medical techniques and procedures first-hand, this guide is an essential read for every outdoorsman—from the novice weekend camper to the most seasoned survivalist. If you can’t find it in The Complete U.S. Army Survival Guide to Foraging Skills, Tactics, and Techniques, then you don’t really need it.